Need new wholesale iron on patches? WholesalePatches.com is your one-stop, problem-free source for great patches, great prices and great service! NOW YOU CAN GET WHOLESALE IRON ON PATCHES NO MATTER YOUR BUDGET! Our top-quality materials and artwork, combined with our rigorous quality control means your wholesale iron on patches will be the best available. As far as price goes, we won’t be undersold, so you can get great custom patches, regardless of the size of your budget! Wholesale iron on patches are an easy way to get the custom patches you want and attach them to garments without sewing. WholesalePatches.com is your Number One source for top quality iron-on patches at unbeatable prices and with terrific customer service! We start with your custom patch design. Our talented graphic artists can help you create a patch design as creative and original as you are! Got an existing design? We can reproduce that as well. We can make wholesale iron on patches in virtually any size or shape you want. 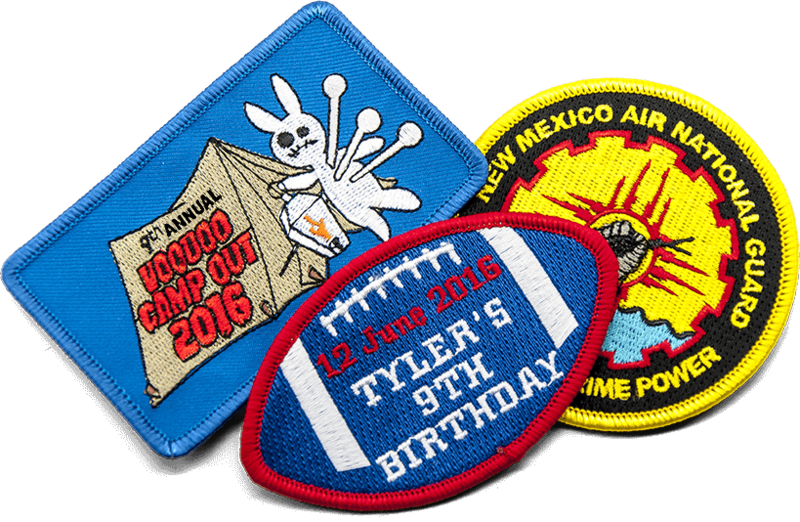 We use the highest quality embroidery threads and twill backing material for your patches. Your patches will be ready to iron onto your garments seconds after you receive them.